Post-Publishing Update (#1): I have discovered a problem with my code for footnotes and am trying to correct it. Urgh. I have not made the time or effort to post anything on this blog for altogether too long. To address this deficiency, I should like to take the opportunity to post on a subject of some importance to the human species and the civilization we have built up over the last few thousand years. As per the post title, I intend here to summarize, using the language I am capable of (layman language, from a scientific perspective), the empirical evidence used to support the generally-held view, among practicing climate scientists and large scientific organizations, of the existence of AGW, and thence of the necessity to develop policy and action to respond to this phenomenon. I shall dedicate some concluding remarks to comment on several objections to these conclusions of climate science. There are two foundational sets of facts which I will here argue underly our understanding of the global climate. The first, which has been a longstanding part of our knowledge, is the existence of the atmospheric warming effect called the greenhouse effect. The second, which is a more recent development, is understanding the importance of atmospheric carbon dioxide within the context of the Earth climate system. First suggested to exist by French mathematician and physicist Joseph Fourier, the atmospheric greenhouse effect allows the Earth climate system to keep the Earth at a comfortable temperature. Fourier calculated that the Earth's temperature ought to have been considerably colder than in actuality, given the size of the Earth and its distance from the Sun. Thus it was necessary to determine by what mechanism the Earth was kept warm. 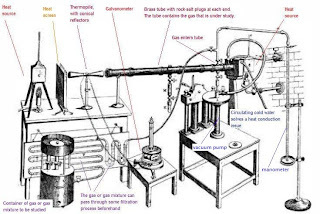 While Fourier suggested a number of potential sources for the warming, Irish naturalist John Tyndall confirmed by laboratory experiment that the atmosphere was responsible. Since then, scientists studying atmospheric physics have quantified the effect of the various atmospheric gases (of which I will have more to say presently). Some additional corroboration of the importance of the atmosphere in maintaining the warm state of the Earth's surface temperatures comes from the study of black bodies and related thermal radiation spectra. An idealized black body, identical in size and in orbit to the Earth, would have a surface temperature of approximately 5°C (or, in the more scientifically appropriate measurement, 278 K), all else being equal. The discrepancy between the calculated surface temperature of an Earth-sized object occupying the Earth's orbit around the Sun and that of the Earth itself is the result of the Earth possessing an atmosphere. The Earth's atmosphere allows the majority of electromagnetic energy, mostly in the form of visible light radiation, from the Sun to strike the Earth's surface, where once absorbed it is re-emitted as infrared radiation. Much of this infrared radiation is absorbed by the atmosphere and some is re-emitted back to the surface. To maintain an energy balance given the above, the Earth system is required to increase temperature to increase its emissions of infrared radiation, which is why Earth surface temperature is much higher than would be expected simply from the amount of incoming solar radiation it receives. Specific components of the atmosphere, most notably water vapour (H2O), carbon dioxide (CO2), methane gas (CH4), nitrous oxide (N2), ozone (O3) and, since they have become atmospheric components due to human emissions, chlorofluorocarbons (CFCs), are responsible for the vast majority of this warming effect. In concluding this summation of the atmospheric greenhouse effect, I should note that, if the Earth's global temperature is in large part regulated by the greenhouse gas components of the atmosphere, it follows logically that altering the quantity of greenhouse gases will in turn alter the Earth's climate. I should also note that the quantity of all greenhouse gases taken together, as a proportion of the entire atmosphere, is scarcely greater than 1%, and the greater portion of that is water vapour. As noted above, the first foundation of our modern understanding of AGW is quite simply that greenhouse gases in the atmosphere allow the Earth surface to maintain a temperature capable of maintaining liquid water, and hence also life as we know it. The quantity of water vapour in the atmosphere is a function of temperature (that is to say, its presence is dependent upon temperature); by contrast, the quantity of carbon dioxide in the atmosphere has both temperature-dependent components (ocean outgassing/intake of carbon dioxide, and rock weathering) and temperature-independent components (organic sequestration, volcanic eruptions and, of late, human emissions). Water vapour is almost entirely restricted to the troposphere, the layer of the atmosphere closest to the surface; carbon dioxide is well-mixed throughout the entire atmosphere. Water vapour is also restricted regionally even within the troposphere (dry regions such as deserts have very little atmospheric water vapour); carbon dioxide remains well-mixed here as well. Water vapour has a very short residence time in the atmosphere before being precipitated out; carbon dioxide has a residence time of decades to centuries. 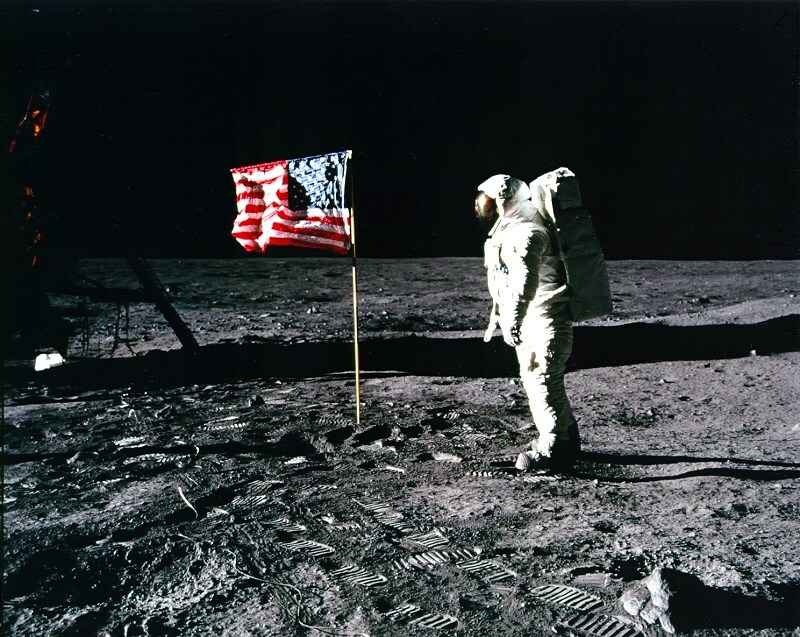 The second line of inquiry resulted from more in-depth studies of the atmosphere and oceans during the Cold War, when scientists researching these on the behest of the US military services were able to combine developments in quantum physics, the mathematics of climate, and of course digital computing to make discoveries with respect to Earth climate and the atmospheric greenhouse effect in the course of their military-related research. The Cold War development of climate science is ably related in Spencer Weart's online text The Discovery of Global Warming. See also this paper (Lacis et al 2010) published by NASA. In the first place, we can find, using empirical evidence, that given basic atmospheric physics as described above there currently exists a large-scale global forcing which is warming the entire Earth climate system. 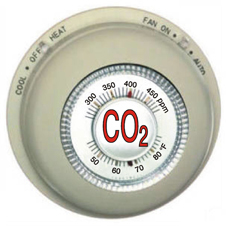 From the above discussions, we can see that a select number of trace gases in the Earth's atmosphere maintain the Earth climate system at a much warmer temperature than would be expected given solely the quantity of energy received from the Sun and that of these gases, the most important historically, by virtue of its temperature-independent emission into the atmosphere, is carbon dioxide (CO2). It follows, then, that altering the proportion of greenhouse gases, and in particular of carbon dioxide, in the atmosphere would have follow-on effects by altering the Earth's climate. In this section, I shall endeavour to outline some empirical evidence showing that the Earth climate system has been steadily warming, particularly since the 1970s. In the following section, I shall endeavour to outline empirical evidence demonstrating that this warming is the increase of the increase of greenhouse gases in the atmosphere, as inferred above. 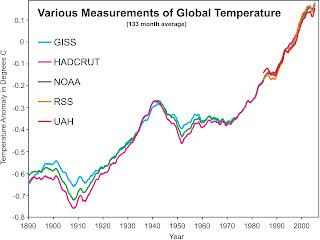 It is, I conclude, quite safe to assert, based on surface temperature records (such as those outlined by NASA's Goddard Institute for Space Studies here), that the Earth has been warming. 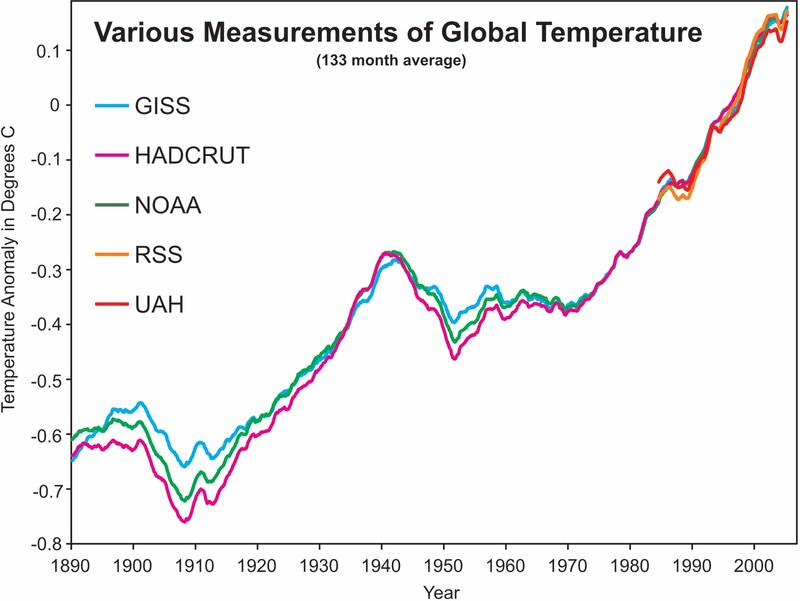 The four surface temperature records documented by NASA show a remarkable confluence and, most importantly, a steady increase in global temperature (as represented by temperature anomaly measurements). A larger version of the graph is available in the linked news article; I will nevertheless include a link. Surface temperature records, it should be noted, are those gathered from surface temperature monitoring stations. For more on surface temperature reconstructions, datasets, and analyses, see here or here. In contrast to surface temperature records, satellite temperature records are gathered from satellites in orbit around the Earth. 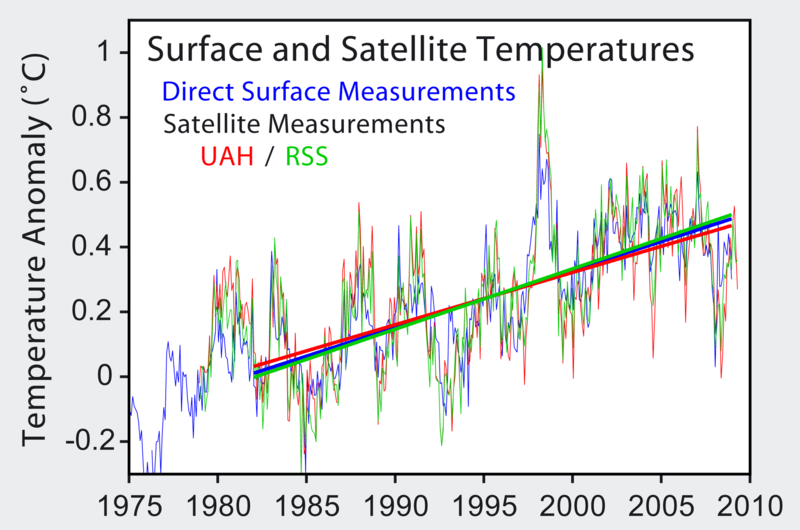 The two major satellite temperature datasets are RSS and UAH (abbreviations explained in the links). Much to my irritation, I was not able to find a similar link for the UAH satellite dataset as for the RSS dataset. A handy comparison of the two satellite datasets can be found here (this link also includes a handy summary of the differences and similarities between the two satellite records). 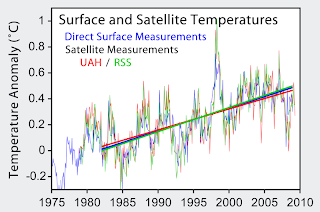 Here we can also see a clear trend line showing warming. Note that satellite records do not directly measure temperature: they use the proxy of measuring, via outgoing microwave radiation, the brightness temperature of oxygen in the atmosphere (see here for more detail). As a final note on the major temperature datasets, this blogger, a professional data analyst, has provided in this post a handy analysis showing the remarkable consilience between the surface and satellite temperature records of the past thirty-odd years. Warming in the Earth climate system is not, of course, restricted to surface temperatures or atmospheric warming. 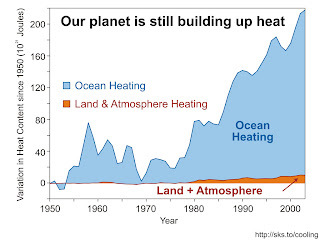 Indeed, these are but a tiny fraction of the warming effect. 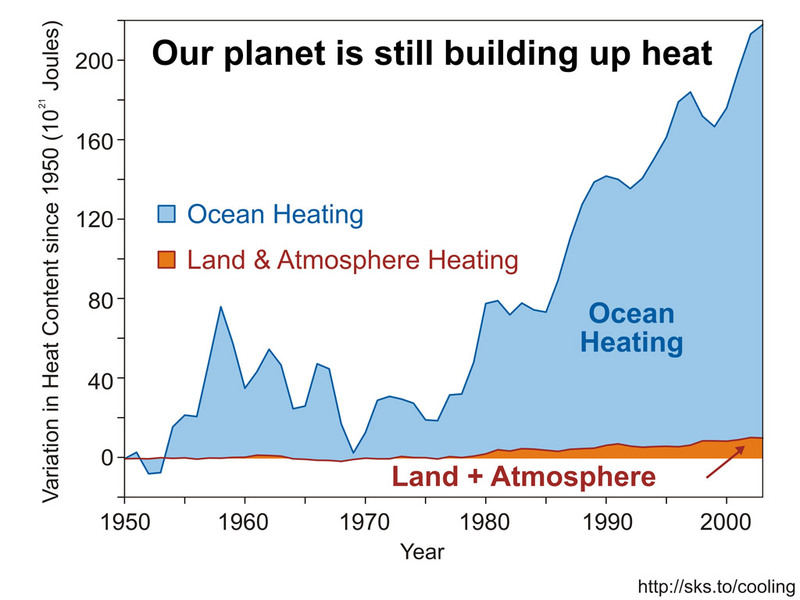 The real action is the increase in ocean heat content (OHC), which is shown graphically here. While one recent paper aimed to show that the oceans were cooling from 2003 to 2008, other papers disagreed, including a key paper which documented warming penetrating even into the abyssal depths (see here). 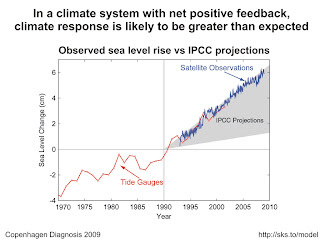 Another empirical indicator of global warming is sea level rise. 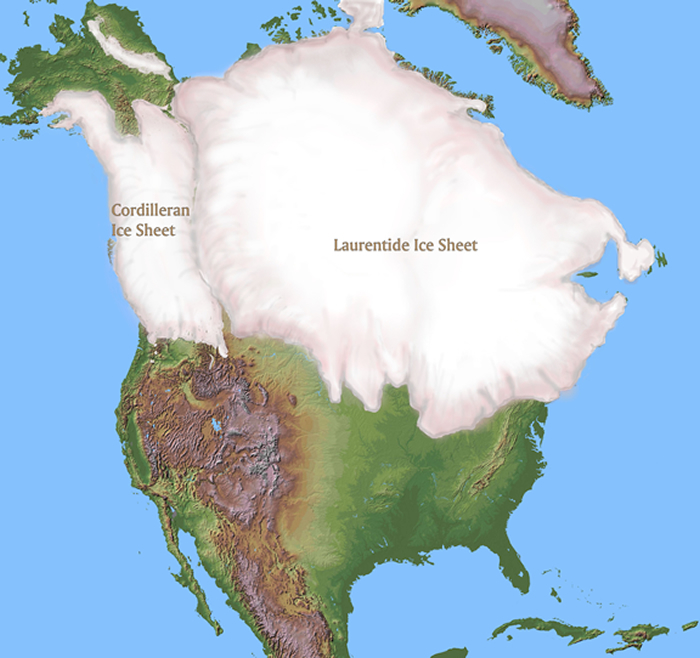 This is partly a result of thermal expansion of existing ocean waters, and partly as a result of melting from the Greenland, Antarctic (continent), and glacial ice sheets. 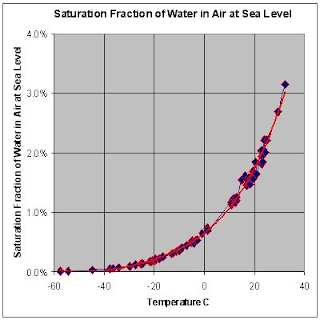 Wikipedia shows a graph of sea level rise from a paper which links tide-gauge information from a specially-selected set of gauges and satellite altimetry information. The University of Colorado also maintains a sea level monitor (trend line in black). Other global mean sea rise reconstructions can be found at PSMSL or CSIRO (abbreviations explained in links). Finally, it should be noted that the empirically measured sea level rise tends to consistently be at the upper end of climate model projections (see pp 17 of this document) from 1990. As noted above in the remarks on sea level rise, ice sheets and sea ice throughout the world are melting away. In particular, Arctic sea ice is vanishing astonishingly quickly (see pp 14 of the Copenhagen Diagnosis figures booklet) compared to what was originally projected by the IPCC. The Copenhagen Diagnosis includes several other figures related to global cryosphere mass balance (and of course, one ought to review the document itself to see from whence the figures are derived). Another analysis of cryosphere melt worldwide can be found here, and a review of Greenland ice melt can be found here. While this latter document is now 2 years old, given all the other ongoing warming, it is unlikely that Greenland ice melt has deviated substantially from the trend shown in that time. Having hitherto established that it is possible, by means of adding additional greenhouse gases to the atmosphere, to increase the global mean temperature, and having established, given the available empirical evidence, that the planet is indeed experiencing global warming, we can now ascertain from whence this warming derives. As we shall soon see, the best explanation is that it is a result of the increase of greenhouse gases in the atmosphere. I shall here point out four empirical lines of evidence demonstrating this: first, the measured increase in carbon dioxide (CO2) in the atmosphere; second, that nights are warming more quickly than days; third, that winter is warming faster than summer; and fourth, that the troposphere is warming while the stratosphere is cooling. This is probably the easiest line of evidence to document. The Mauna Loa observatory in Hawaii keeps a constant record of atmospheric carbon dioxide (CO2) levels, and this site keeps what appears to be a more-or-less up-to-date record of current CO2. The Wikipedia article discussing the matter also provides some additional background, in particular how current CO2 concentrations compare to the recent geological past. 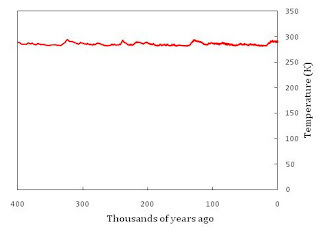 Suffice it to say that the CO2 concentration has risen from an approximate 280 ppm over two centuries ago, a level which was hitherto more or less stable since the end of the last glacial period, to approximately 394 ppm as of this writing. Notice something about the recent past? As a warmer atmosphere contains more water vapour, there is more cloud cover in some areas. Large-scale cloud cover acts as both a negative feedback (by reflecting incoming sunlight back into space) and as a positive feedback (by reflecting outgoing longwave radiation back to the surface) to climate forcings; the latter feedback being more prominent at night when there is no incoming sunlight. 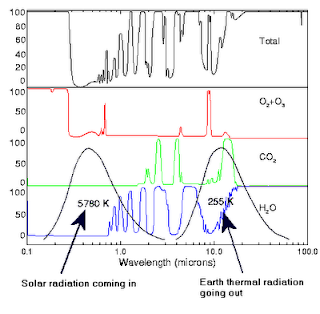 Greenhouse gas climate forcing, as noted above, is masked by incoming sunlight during the day. At night, the effect is more prominent. Notwithstanding seasonal and weather-related variation, daily maximum temperatures, which occur most often during the day, are primarily driven by incoming solar radiation, and daily minimum temperatures, which occur most often at night, are driven by the presence or absence of reflected longwave radiation from clouds and greenhouse gases. In a world where greenhouse gases are on the increase, such would result in a steady convergence of daily maximum and minimum temperatures. As noted in the Braganza 2004 study linked above, this is indeed observed to be the case. The naturalist who first suggested humans could affect the climate by adding CO2 (then generally referred to as carbonic acid), Svante Arhennius (per his 1896 paper), also predicted that in such a case winters would warm faster than summers. The reason why this would be so is similar to why the convergence in diurnal temperature range is a marker of greenhouse warming. Incoming solar radiation in any hemisphere is greater during the summer than during the winter, often much greater. However, backradiation of infrared radiation from the surface on the part of greenhouse gases continues steadily all year round. The effect is obscured during the summertime by the greater amounts of sunlight. The final notable feature of greenhouse warming which I wish to bring up is the manner in which the different layers of the atmosphere react to the climate forcing. Whereas an increase in solar radiation would heat the entire atmosphere from top to bottom, greenhouse warming is predicted to: - warm and expand the troposphere (the lowest layer of the atmosphere); - cool and contract the upper layers of the atmosphere (the stratosphere, thermosphere, etc.). The reason we expect this would be the case in the event of greenhouse warming is, I suggest, two-fold. First, a greenhouse gas forcing warms the atmosphere, allowing the air to hold more water vapour, itself a greenhouse gas. As described above, water vapour is mostly concentrated in the troposphere. We would thus expect the warming effect, including water vapour feedbacks, to be concentrated in the troposphere. Second, the noted expansion and contraction is simply a consequence of the behaviour of gases to temperature increases or decreases; each layer of the atmosphere reacting appropriately. It so happens that, in addition to the above-noted empirical observations supporting greenhouse warming, we find that the tropopause (the boundary between the troposphere and stratosphere) is changing in height due to tropospheric warming, and the stratosphere and other upper layers are cooling and contracting. So, we have seen that empirical measurements show the Earth climate system is experiencing a global warming, and that this warming can be traced, based on particular observed characteristics, to the action of an increase in the proportion of greenhouse gases in the atmosphere. This leaves the final piece of the puzzle to be answered: from whence came these gases? So far, we have seen that rather basic physics suggests that a change in the proportion of select, trace gases in the atmosphere can cause substantial changes to global climate, through the increase or decrease of global mean temperature. We have seen that of late a substantial global warming has been observed and that this global warming can be traced to the increase of the greenhouse gases. We shall now show, once again by means of empirical evidence, that the increase in these gases is the result of the activities of human beings - putting the 'anthropogenic' in anthropogenic global warming (AGW). The most important manner in which humans cause global warming is the emission of greenhouse gases into the atmosphere by means of the combustion of fossil fuels. 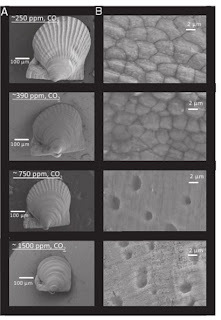 Fossil fuel combustion can be shown to be the primary source of increased carbon dioxide and other non-condensing greenhouse gas concentrations on account of changes in the isotope ratio of atmospheric CO2. Of course, we can also calculate aggregate human emissions of carbon dioxide, other greenhouse gases, and other warming forcings such as land use changes and compare this to net natural fluxes. We can also compare the rate and nature of the present increase of greenhouse gases and resultant warming compared to past warmings. Finally, we can validate our observations through hindcasting climate models. The most common form of carbon atom, the isotope Carbon-12 (or 12C) has 6 protons and 6 neutrons, resulting in a stable atomic configuration. A rather less common yet still stable carbon isotope is carbon-13 (13C) with 6 protons and 7 neutrons. There is a naturally-occuring radioactive form of carbon, carbon-14 (often known as radiocarbon), which decays via Beta decay into nitrogen-14. Carbon-14's half-life is approximately 5,700 years (hence the widespread use of radiocarbon in archeological & geological dating (the latter for nearer-term strata as older geological samples will be largely devoid of radiocarbon). We may infer that, if the rise in atmospheric CO2 is the result of humans burning fossil fuels, it follows that the return of fossil carbon to the atmosphere should reduce its ratio of 13C:12C. As Ghosh et al 2003 shows, such a reduction can be measured to have taken place. Compared to overall anthropogenic emissions. Another possible validation of this marker of human influence on atmospheric CO2 might be found in this paper published in the Journal of Agricultural and Food Chemistry. Without having money to burn on buying subscriptions to scientific journals or belonging to an institution with a subscription, I must report with disappointment that the paper is behind a paywall. Having established that the effect of fossil fuel combustion can be measured in the atmosphere, we can examine the aggregate of human carbon dioxide emissions from fossil fuel combustion. Although the oceans and the biosphere have absorbed much of human carbon emissions, we can see from the increasing concentration of atmospheric carbon dioxide and the changing carbon isotope ratio noted above that a substantial quantity of human emissions remain in the atmosphere. 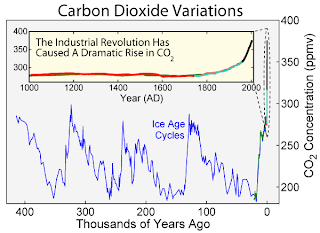 In addition to the measured alteration in atmospheric carbon isotope ratio, and the measured surge in anthropogenic carbon emissions due to fossil fuel combustion, we can validate the human source of emissions by reference to the time scales involved. The primary forces that affect long-term carbon dioxide levels in the atmosphere are volcanism, rock weathering, and biological sequestration (the latter process being how fossil fuels are formed in the first place). These processes operate on geological time-scales, that is to say, over the course of hundreds of thousands to millions of years. Even shorter-term large-scale fluxes in atmospheric carbon (such as carbon dioxide feedbacks to Milankovitch cycles) operate comparatively slowly, on the order of hundreds to thousands of years. 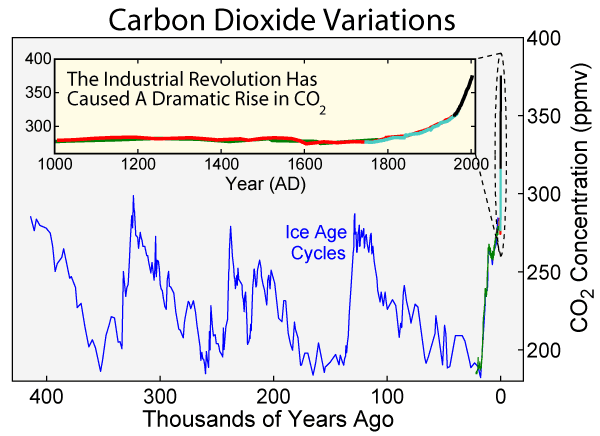 By contrast, as shown earlier the carbon dioxide concentration in the atmosphere can be shown to have increased from approximately 280 ppm at the end of the 18th century to almost 400 ppm in the present day, a rate of change that is likely unprecedented in the history of the Earth due to the time-scales required for large-scale changes in atmospheric carbon. Certainly the current rate of change of atmospheric CO2 is much greater than the most recent previous period of unusual global warming, the Paleocene-Eocene Thermal Maximum. 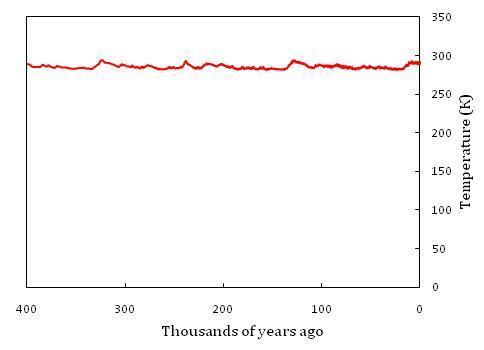 This graph also shows the current rate of change well by comparing the atmospheric CO2 measured during recent times to those sampled from ice cores with records stretching back 800,000 years. It should be noted before proceeding that this is the first time I am appealing to climate models as evidence in their own right (see note (8) below for context). 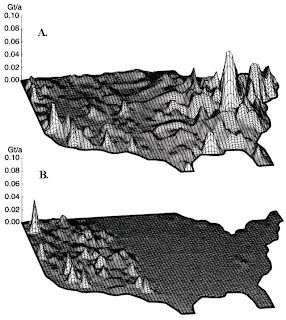 For an in-depth discussion on the history of climate models, you may wish to read this text. For some observations on the reliability of climate models, please see here. One way in which climate models are validated is through hindcasting. By this process, a model is tested to see if it can match the empirically-observed changes in the Earth climate system to date. In this way, hindcasting offers another means of validating the human factor in the enhanced greenhouse warming. If, as would-be skeptics claim, anthropogenic climate forcings are non-existent, weak, or pale in comparison to non-anthropogenic forcings, then removing anthropogenic forcings should not affect the hindcast significantly. What we find, when creating model runs which omit anthropogenic forcings, is that they fail to match the historical empirical observations entirely. Only by including known anthropogenic and non-anthropogenic forcings can model runs accurately match real-world observations. The hindcasts don't match the observations in the absence of anthropogenic forcings. Based on empirical measurements, the source of the increased greenhouse gases can be traced to human activities. The human effect on global climate is an ongoing part of an enormous, inadvertent geoengineering experiment which our species has embarked upon. All that remains to be determined is what the consequences will be. 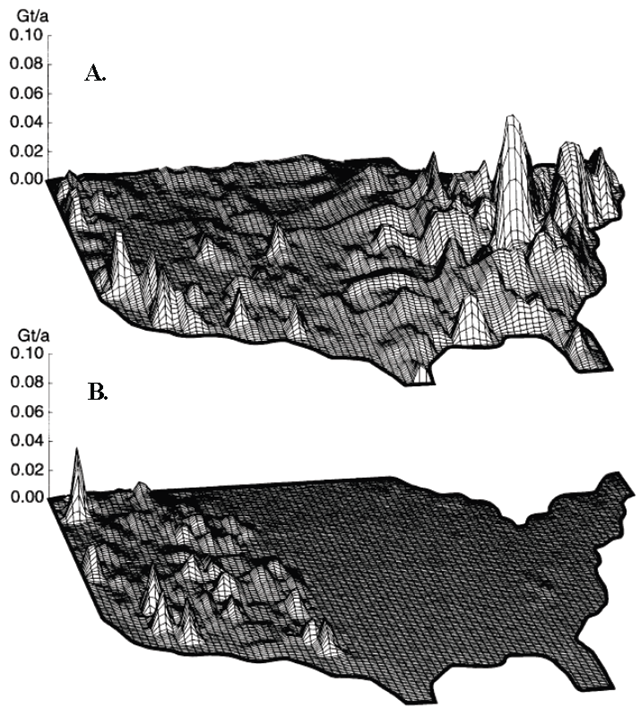 Image (A) is earth moved by humans in the US. Image (B) is earth moved by rivers. The first level comprises the direct, first-order consequences of the massive injection of fossil carbon into the Earth system and the resulting enhanced greenhouse effect: ocean acidification, sea level rise, glacial melt, distortion of weather cycles, and fast feedbacks. The second level comprises the second-order consequences to human society and natural ecosystems: disruption/destruction of agricultre, disruption & destruction of economic activity and infrastructure, and disruption/destruction of ecosystems and ecosystem services. The first-order consequences of anthropogenic global warming flow directly from either human emissions of non-condensing greenhouse gases (primarily carbon dioxide, but methane, CFCs, and others also count) or from the enhanced greenhouse effect that the presence of these gases in the atmosphere engenders. That is to say, the consequences follow from the interaction of atmospheric chemical composition, atmospheric radiative physics, and the wider Earth climate system. As noted earlier, the oceans absorb some of the human emissions of carbon (approximately 30%, as it turns out). This has rather important consequences, since the dissolution of carbon dioxide into the oceans results in a decrease of oceanic pH. Global oceanic pH is estimated to have decreased from approximately 8.2 to 8.1 from pre-industrial times to the turn of the century. Per basic chemistry, this reduction in pH is known as acidification. What makes ocean acidification important as a consequence of carbon emissions is a matter of scale. First of all, the sheer amount of dissolved CO2 required to accomplish even this seemingly-trivial change is enormous, given the volume of water in the oceans. 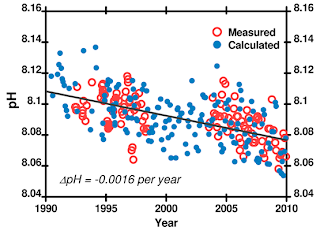 Second, due to the logarithmic nature of pH measurement, the mere 0.1 decrease in pH represents an approximate 30% change in the oceans' 'acidity' (as represented by H3O+ ion concentration). Third, and most importantly, the rate of change - a 0.1 drop in pH over approximately 150 years, is estimated to be 100 times greater than the relatively rapid (by geological standards) changes in ocean pH at the end of glacial periods. In short, an enormous alteration in the chemical composition of the ocean is occuring at a rate that is unprecedented in recent geological history. The rapid change results in difficulties for ocean-dwelling species which rely on calcification (the formation of calcium carbonate) to build shells, exoskeletons, and the like. Some rundowns on the negative impacts can be found here (for general impacts), here (for impacts to coral specifically), and here (for impacts to shellfish specifically), in addition to any impacts discussed in the links of this subsection's header. Skeptical Science has also had, since the end of June 2011, an excellent primer series on the chemistry behind Ocean Acidification. I have already documented that sea level rise is occuring; this was shown to be an empirical way to demonstrate the reality of global warming. Sea level rise is an empirical marker of global warming as it is a consequence, of necessity, of warming. Sea level rise has recently been proceeding at a rate of 3 mm per year. If this rate were to hold steady, by the end of this century, perhaps we could breathe easy. However, the main drivers of sea level rise, Greenland & Antarctic land ice melt, are themselves increasing in rate (see the section on cryosphere melt in the empirical evidence for global warming as well as here), which suggests that sea level rise will also increase. Examinations of past climate regimes (such as Kopp et al 2009) suggest that once sea level rise levels off, sea level will be rather greater than we would like. Taking into account my earlier comment that empirically-measured sea level rise is at the upper limit of previous model forecasts, it seems to me that current best estimates suggest a sea level rise, by the end of this century, of approximately 1 meter. This paper (Verneer & Rahmstorf 2009) estimates a global sea level rise, from a 1990 baseline, of 75 to 190 cm by 2100. For a personal point of reference, 75 cm is approximately three-quarters of the way up my leg from the ground, and 190 cm would completely submerge me in water. Suffice to say, any warming effect which can effect melting of the enormous Greenland and Antarctic ice sheets will have a similar effect on the much smaller glaciers across the world. I have separated out the melting of glaciers from the melting of the Greenland/Antarcic land ice sheets as a consequence of AGW because of a consideration peculiar to the melting of the former: the effect of sustained glacial melt on freshwater systems which are fed by glacier meltwater. Some sources which provide an overview of river systems dependent upon glacial melt include Brittain & Milner 2001 and Dorava & Milner 2000 (sadly behind a paywall). We can see, from empirical measurements, that glaciers worldwide are in retreat. Given their much smaller mass, they are far more vulnerable to melting than the big ice sheets. I do not think it a stretch to say that, even if the estimates of their disappearance end up being wrong for some reason, the world's glaciers will eventually melt completely away. This phenomenon also applies to snowpack melt. The pattern for glacial and snowpack melt is, initially, one of increased melting during the spring due to temporary increases in accumulation because of increased overall precipitation (a consequence of increased water vapour content) and increases in melting rates because of warming and a less favourable rain/snow ratio during winter. This pattern tends to lead to increased flooding in vulnerable areas as larger pulses of meltwater occur during the spring, until such time as the snowpack & glacier deterioration is sufficiently advanced to reduce overall water flow (leading to shortages of fresh water supplies). One of the authors of the NOAA State of the Climate 2009 report, Deke Arndt, characterizes the relationship of climate to weather as something to the effect of "climate trains the boxer, weather throws the punches". One obvious way that AGW can distort weather is increased precipitation, which is a consequence of the warmer atmosphere holding more water vapour. You can see this trend holds good for most of the United States and Canada. The Canadian data includes a handy table showing annual precipitation deviation from a 1951-1980 baseline, which shows both the overall long-term increase and also the variability imposed by stochastic processes. Of course, the US and Canada are small regions of the world. As this (admittedly somewhat old) map from NASA shows, the Earth's global precipitation increased steadily in the period 1900-1988. Curiously, the NOAA suggests a more equivocal picture (one suspects, based on the global map provided, that this is due to incomplete data). 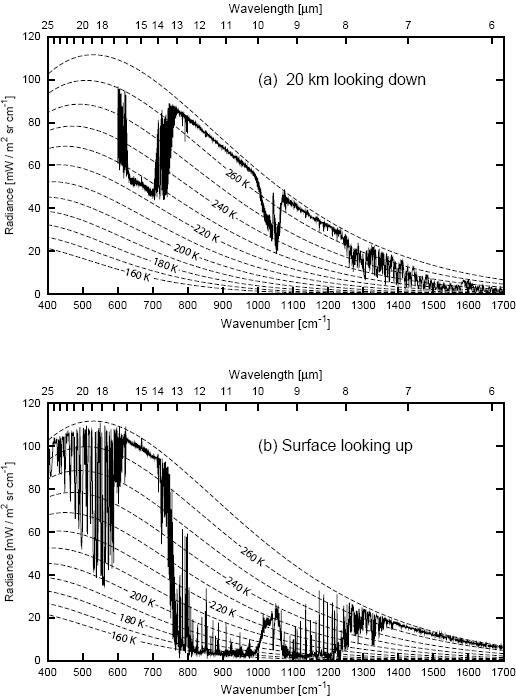 New et al 2001 suggests precipitation has increased overall (see the plates on pp 16). You can also see how AGW can accelerate the hydrological cycle. Global warming also alters precipitation distribution patterns. For example, this artcle reviews a paper documenting alterations to global storm track patterns. A more thorough list of papers dealing with the expansion of tropical atmospheric cells here. You can also see an analysis of ongoing drought concerns in the Sahel here, or an analysis of Amazon region droughts in the first decade of the 21st century here. Both droughts are once-in-a-century events. As you can see, the 2010 drought is much more severe than 2005. This 2010 year-ender notes some similar, interesting elements of distorted weather in 2010. This basic-level article describes a perverse consequence of Arctic warming. The final, and most concerning first-order consequence of anthropogenic global warming is the possibility that, once AGW has shifted the climate past certain tipping points, large-scale fast feedbacks are likely to kick in and send the Earth climate system into an irreversible (by human-scale standards of time), unprecedented (in the human experience) warming. The major sources of these potential fast feedbacks are the astonishing quantities of methane trapped in permafrost and in undersea clathrates. Of some concern, then, is the fact that clathrates in Siberia are observed to be venting methane, meaning that fast methane feedbacks may already be kicking in. The second-order consequences of global warming are the consequences to ecosystems and human systems which follow from the first-order consequences as described immediately above. Before making any comments of my own, I should like to link to the USDA report on the effects of climate change on agriculture (and other resources). This report outlines the USDA's calculations on the expected effects of climate change to agriculture in the US. The "Coles' Notes" summary of agricultural impact is in the table on page 74. In the conclusions, the report notes that, for the next thirty years, decreases in primary production agricultural yield from temperature rise, and increases from CO2 rise tend to balance each other out - however, going further forward the yield increase from CO2 will not keep up with the temperature-induced yield decrease. In addition, climate change will tend to favour weeds over useful agricultural plants, will alter availability of beneficial insects vs. pests, will favour unproductive plants in rangelands over productive ones (here by productive I mean suitable for consumption by ranging livestock), and in warmer regions will reduce the productivity of livestock. Thanks to markets in agricultural products, we have a proxy for climate effects on agriculture by means of prices. Simply put, the price of agricultural products depends on intersection of demand and supply for those products. I do not think it is controversial to state that the increasing population and affluence of human beings has driven up the demand for staple crops overall. The limiting factor in determining price is supply, which is susceptible to climate disruptions. This website links to a dynamic chart showing a futures price shock in 2008 and another price shock in late 2010. It remains to be seen whether the higher 'baseline' price shown from 2007 on will remain in effect (and if so, for how long) - or worse yet (from the crop consumer perspective) whether the 2010-2011 price shock is going to lead to a new, higher baseline price level. Of course, crop futures prices are in part driven by actual crop prices, so the price shock in futures markets has a corresponding price shock for crops themselves. For some socioeconomic effects of such price shocks, see here or here. Wikipedia has what appears to be a useful summary of the sources of the 2007-2008 price shock. From this point on the article describes three direct environmental causal factors: natural disasters, soil & productivity loss, and low-altitude ozone poisoning. The natural disasters can be attributed, to some extent, to human CO2 emissions and their knock-on effects as described above. For more on the current rise in food prices, see this World Bank report. Interestingly, the 2010-2011 food prices are posited among some quarters to be among the causal factors of the Arab Spring (although the Telegraph article I have linked to posits Federal Reserve policy change rather than climate change as a principal factor in food price swings). Based on the estimates provided in the USDA report, and on the causal factors of the 2007-2008 and present food price shocks, it is in my estimation reasonable to infer that AGW has already had negative impacts on human agriculture, is continuing to have such impacts, and these impacts will only increase in severity and frequency in the future. 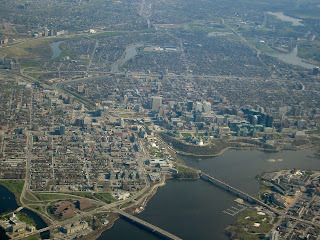 While below I will comment on extant and likely future impacts of AGW on day-to-day activity, here I should like to comment on impacts on capital wealth and infrastructure - that is, the effects that global warming will have on the things that humans have built (cities, road networks, and the like). In my description of first-order effects of AGW, I mention two factors which have the most impact on infrastructure: sea level rise and altered weather patterns. The first, of course, has a direct effect on coastal regions (see, for example, here. I invite the reader to examine the area inundated by a 1-metre sea level rise in the cases of New Orleans, Miami, the Netherlands, and Bangladesh and imagine the direct monetary loss of infrastructure & the follow-on insurance losses that such a rise entails. Altered weather patterns can also result (and have also resulted) in the destruction of infrastructure, plant, and other semi-permanent human installations: tornadoes and hurricanes, drought-induced wildfires, and rain-induced mudslides, can all wreak tremendous and expensive destruction. This is all the more the case when the two factors coincide. Consider the case of Hurricane Katrina. As with any single weather event it is hard to tie it conclusively to climate change. However, we know that by 2005 global mean sea level was approximately 200 mm higher than it was in 1870, and of course by 2005 (which, until 2010, was the warmest year on record) global warming was already in full swing training the boxer called 'weather' to throw harder punches such as Hurricane Katrina (see, for example, a summary of its effects on New Orleans). It seems entirely reasonable to me to suggest that the combination of predictable consequences of AGW (higher mean sea level, leading to stronger storm surges, and altered weather patterns) and other factors (including the erosion of coastal areas and barrier islands) allowed Hurricane Katrina to cause the damage it did. As described above, one of the current best estimates for sea level rise is 75 cm (0.75 m) to 190 cm (1.9 m) by 2100, putting us within easy reach of the 1 m inundation scenario within the lifespan of people currently 20 years old or younger. As described above, here I shall enumerate some of the potential disruptions to everyday social, political, and economic activity which, in my opinion, follow from what is known from global warming. 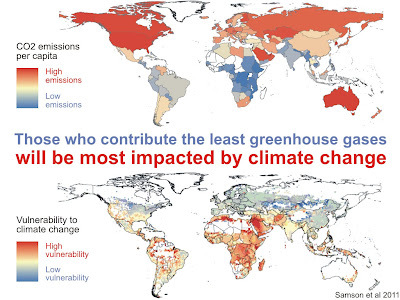 A study (Samson et al 2011), which is unfortunately behind a paywall, suggests that those worst affected by climate change will be those living in the poorest regions of the world, and that further they are the ones who hitherto have contributed least towards the problem (given the centuries-long residence time of carbon dioxide in the atmosphere). This will likely be a result of the findings of Deffenbaugh & Scherer 2011, who suggest that the tropics will be subject, in a matter of decades, to a new seasonal heat regime (see also here). Of course, higher-latitude regions are also affected: New Zealand ski hills & fields are suffering from an unusually bad (warm & snow-bereft) winter. While regional & short-term variables of course are more important at this scale than at the global climate scale, I suggest it is very likely that we shall see more of this in the future, since the short term variation is superimposed over the long-term warming trend. Readers are invited to review this article laying out the extreme weather occuring in 2010-2011 up until the post (late June, 2011) and count up the costs already incurred in terms of disruption of everyday human activities, loss of life & livelihood, and cost to make good on the damages (especially large-scale disasters such as the 2010 Pakistan floods or the 2011 Texas wildfires). There is also the matter of refugees. Areas most vulnerable to sea level rise (such as southern Florida, Bangladesh, the Netherlands, and a large number of small Pacific islands) will as a matter of course require the relocation of their (millions) of current residents. The hotter seasonal temperature regime I have linked to earlier will, if it comes to pass, also result in increased migration from tropic to higher-latitude regions. Where will those displaced by sea level rise & other climate-derived disruptions move? Which countries will take them in? One country that is not likely to want to accept large numbers of refugees is the United States, which, quite apart from any political difficulties, will have its own set of climate refugeers thanks to its low-latitude regions (of which I have already mentioned those most vulnerable to sea-level rise as well). 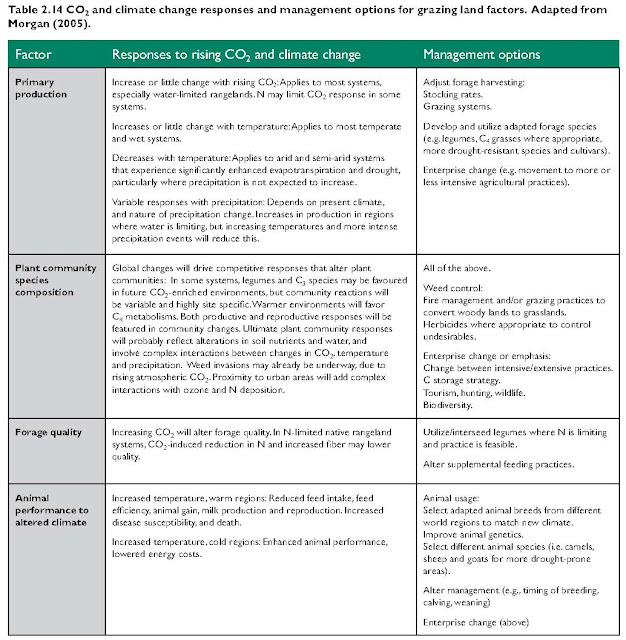 It is difficult to untangle the various ways that human activity has impacted ecosystems; nevertheless the impact of mass carbon emissions and their follow-on effects can be reviewed separately from other human activities. The most important, of course, is the matter of rate of change. As I have alluded to above, the rate of human emissions has meant that global climate change and ocean acidification are both occuring at rates which are unprecedented in recent geological history, and further, to the extent that they are not unprecedented in overall geological history, they present unwelcome ramifications. A summary from Skeptical Science. The list of four aspects of the unfortunate uniqueness of AGW at the close of the summary are probably the most important take-away points. While polar bears are the iconic symbols of species affected by climate change, the fact of polar amplification means that all other species in the Arctic are vulnerable (indeed, more vulnerable than most since species in lower latitudes can at least seek relief via migration to higher latitudes whereas the species already in the highest latitudes have nowhere else to go). This video by Peter Sinclair summarizes the recent behaviour of the walrus, which is forced to withdraw from its preferred habitat - sea ice over shallow Arctic ocean waters - because the sea ice is melting away. The results are not favourable for the the walrus. Again from Skeptical Science, a summary of papers in the scientific literature on impacts of AGW. For the purposes of this subsection I invite you to review the papers under the Agriculture, Arctic Melt, Environment, and Glacier Melt headings, as many of these papers describe impacts to ecosystems both within and without the context of consilient human impacts. The United States' National Academy of Sciences has published a booklet (available online) for the lay reader detailing ecological impacts of AGW within the United States. The booklet is itself a summary of what I take to be a more detailed 2009 report on the matter (downloading the free PDF requires registration). The Santa Barbara campus of the University of California is host to the National Center for Ecological Analysis and Synthesis (American spelling of centre, of course), which has its own resource centre for reviewing ecological & ecosystem impacts of AGW. There is always, of course, the IPCC, a body established by the United Nations Environment Programme (UNEP) and the World Meteorological Organization (WMO) to review, summarize, and articulate the state of climatology with regards to AGW. The IPCC's 2007 Fourth Assessment Report includes a substantial section on expected impacts, including ecosystem impacts. The section on impacts can be found here. In case you were wondering, the IPCC reports have enormous reference sections (such as this one). 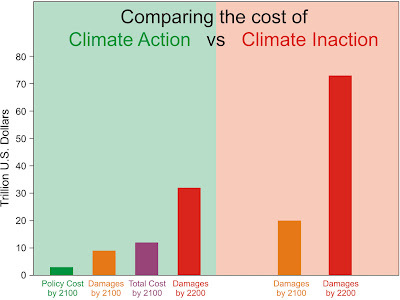 Climate Change is expected to have very rapid increased impacts in all cases. The rate of change of global climate & ocean chemistry conditions is such that it is very likely to outstrip the ability of ecosystems to adapt. Whatever time in the future the changes to climate & ocean chemistry have ceased, it is very likely that the new conditions, mirroring those of millions of years past, will be alien, even hostile, to almost all extant species. When these two considerations are taken together with other current and forecast anthropogenic impacts on ecosystems, it is very likely that currently-stressed ecosystems and species will collapse or disappear altogether and that otherwise robust ecosystems & species, including those built up by humans, will themselves become dangerously stressed. In my note (2) I have already included a link to a comprehensive, perhaps even exhaustive, resource of common objections to the findings of climatology and to the advocation of policy to reduce human emissions of carbon dioxide. I will, however, summarize some of these objections below. The first line of argument against the mainstream (or consensus) position in climatology, which I feel I have fairly summarized above, is that somehow the reported global warming is not happening, or that the atmospheric greenhouse effect is not real. I will include a handful of objections on this line of argument. The objection to AGW via the argument from thermodynamics is incorrect. The second law of thermodynamics is itself incorrect. This empirical data shows the argument from thermodynamics is false. Even notable contrarian (16) scientists, such as Roy Spencer do not make this argument. 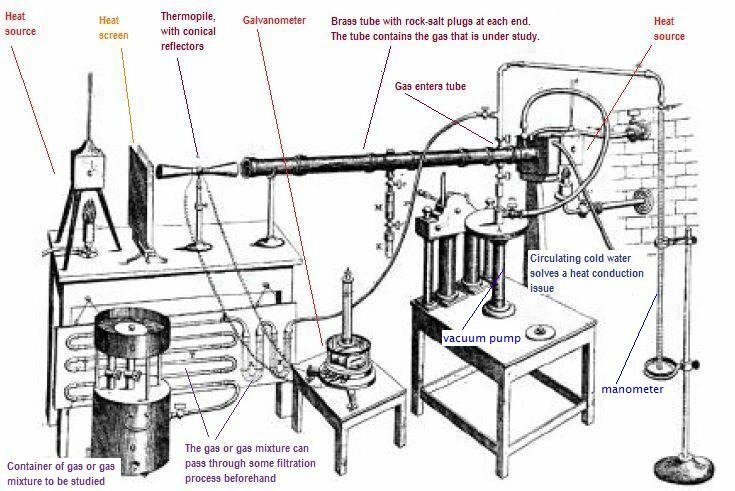 On his own blog, Dr Spencer points out that it is possible even for the scientific layperson to verify the existence of the greenhouse effect by measuring infrared backradiation from the atmosphere. Indeed, I am not aware of any well-known contrarian who is also a practicing scientist who agrees with the argument from thermodynamics as an objection to the mainstream understanding of climatology. The counter to these arguments, of course, has largely been outlined in the opening section of this post, explaining why CO2 and not H2O is the 'control knob' of the Earth climate system. The rebuttals I have linked to at Skeptical Science provide additional information. Most experts stuck by the old objection to the greenhouse theory of climate change — in the parts of the spectrum where infrared absorption took place, the CO2 plus the water vapor that were already in the atmosphere sufficed to block all the radiation that could be blocked. In this "saturated" condition, raising the level of the gas could not change anything. But this argument was falling into doubt. The discovery of quantum mechanics in the 1920s had opened the way to an accurate theory for the details of how absorption took place, developed by Walter Elsasser during the Second World War. Precise laboratory studies during the war and after confirmed a new outlook. In the frigid and rarified upper atmosphere where the crucial infrared absorption takes place, the nature of the absorption is different from what scientists had assumed from the old sea-level measurements. A modern spectrograph shows a set of peaks and valleys superimposed on each band, even at sea-level pressure. In cold air at low pressure, each band resolves into a cluster of sharply defined lines, like a picket fence. There are gaps between the H2O lines where radiation can get through unless blocked by CO2 lines. That showed up clearly in data compiled for the U.S. Air Force, drawing the attention of researchers to the details of the absorption, especially at high altitudes. Moreover, researchers working for the Air Force had become acutely aware of how very dry the air gets at upper altitudes—indeed the stratosphere has scarcely any water vapor at all. By contrast, CO2 is fairly well mixed all through the atmosphere, so as you look higher it becomes relatively more significant. To boil things down, then, the main rebuttal to an argument from weak carbon dioxide forcing is that the constraints on water vapour concentration in the atmosphere (and in particular its temperature-dependent nature), the increased ability of carbon dioxide to absorb infrared as its concentration increases, the gaps in the overlap of water vapour & carbon dioxide absorption, and paleoclimate data (as summarized by Dr Alley) all point to carbon dioxide having a dominant role as a forcing or feedback which is not subject to saturation at the concentrations in which it is presently found or is projected to reach in the atmosphere this century. A third approach, instead of working from physical principles, is to argue that the empirical evidence showing warming (whatever the cause) is false. One of the most famous attempts to make this argument is that by meteorologist Anthony Watts, who has suggested that the United States' weather-monitoring surface stations (which provide data for global temperature reconstructions) are unreliable on the matter of supporting a global warming temperature trend. Indeed, he has embarked upon a major project to document US weather stations and show how many of them, whatever conditions they were installed in, are now sited in such poor conditions as to inevitably show a warming trend. An alternate form of this argument is that unjustified adjustments have been made to the data from weather stations, which corrupts the results and (on Watts' view) shows a warming trend that would otherwise not be present. If so, it would follow that the reported global warming could simply be an artifact of weather station placement. In other news, cherries are delicious. The second rebuttal is that the line of argument as deployed by Watts turns out to be false. The portion of the Skeptical Science rebuttal most relevant to this discussion is that showing the temperature trends of the weather stations' non-adjusted vs. adjusted data. 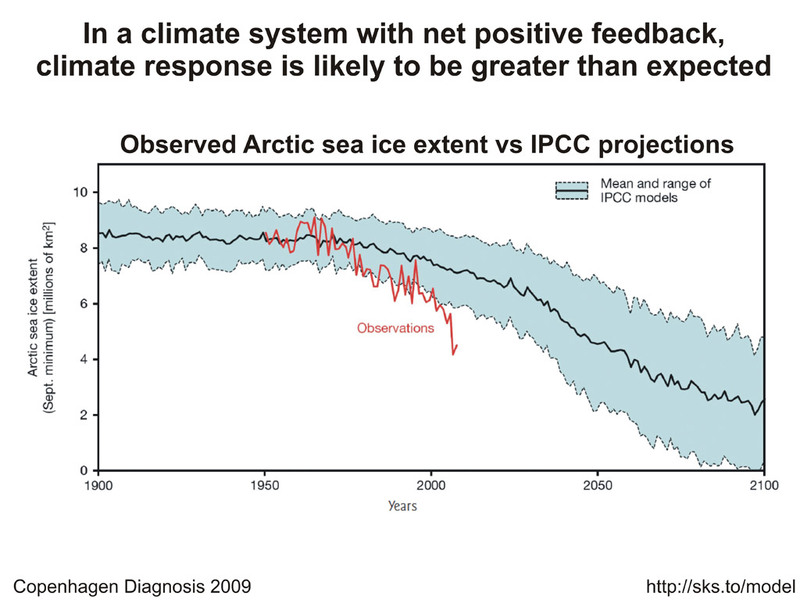 The graph shown demonstrates that the data are almost in complete agreement. Another perspective is offered here. The paper discussed analysed the data provided using Watts' own categorization of weather station quality, and found that the supposedly good-quality stations showed more of a waming bias than their poor-quality counterparts. The "good" stations show a stronger warming trend than the "bad" stations. The argument from conspiracy is perhaps the most common contrarian argument, if online articles & comments, letters to the editor, opinion columns, and the like are any indication. The argument from conspiracy infers that global warming is not real on the basis of an almost invariably unsubstantiated premise such as "peer review == theocracy" (19), "AGW science == hoax", "AGW science == UN/leftist/Marxist/eco-facist conspiracy", or similar. There are two general reasons why the argument from conspiracy can usually be dismissed outright. First, as noted above, it is very rarely substantiated by the claimant in a verifiable manner. Second, the suggestion that the entire body of major scientific organizations worldwide, along with thousands of researchers working for government, academic, and private organizations, are engaged in a massive conspiracy for grant money or to establish a globe-spanning tyranny is simply ridiculous on its face, on the scale of the 9/11 "Truther" conspiracy theory. In short, the argument from conspiracy is at best a failure to critically examine sources, and at worst a sign of scientific denialism. Phil Jones describing the use of Nature tricks to "hide the decline". The argument from conspiracy suggests that temperature data showed global cooling, and Jones was discussing cooking data to hide this. In reality, Jones was discussing the divergence problem in dendrochronology, whereby certain sets of tree rings (mainly extracted from Alaska) used as proxies for historical temperature data were found to lose their accuracy in this regard sometime around the 1960s. This divergence problem was openly discussed in the peer-reviewed literature since at least 1995 (hence Dr Jones' reference to Nature). The 'trick' in question was, when creating an overall temperature reconstruction including tree ring proxy data, to superimpose the instrumental temperature record and excise the tree ring data at the point of divergence. 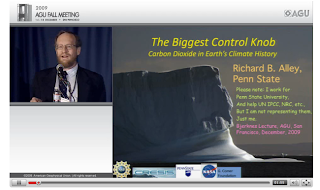 Kevin Trenberth discussing limitations on the ability to track energy change in the Earth climate system, describing the inability of him & his team to do so at the time as a travesty. Because the words 'lack of warming' appear in his correspondence on this matter, it is common for his statements to be misinterpreted as claiming the Earth climate system is not warming. A large number of inquiries made into the matter have all cleared the scientists involved of wrongdoing (I wish to emphasize the US Department of Commerce & the UK House of Commons reviews). 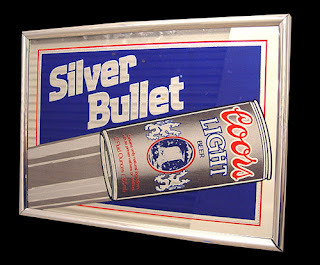 It's closer to this silver bullet. Although there are other variations of the above arguments, and indeed other forms of claims which attempt to demonstrate that the observed global warming is not real, for reasons of time & space I will not outline them here. If the first line of argument is unconvincing, then the concession is made that the Earth climate system is indeed warming. Human agency in this process, however, can still be objected to. I shall here refer to three general arguments made against human agency. This is a very straightforward argument. Based on the premise that, as the ultimate source of almost all heat energy in the Earth climate system, one concludes that the Sun is the source of the observed global warming, rather than humans. As described previously, the atmospheric greenhouse effect is what allows incoming solar energy to heat Earth surface temperatures above the freezing point of water in the first place. 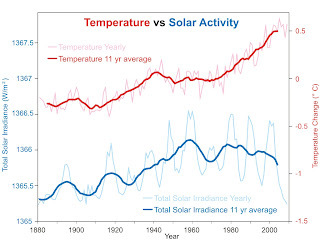 Changes to incoming solar energy sufficient in magnitude to cause the current climate forcing occur on very long time scales compared to the time frame the current climate forcing has occured in. A global warming resulting from predominantly solar forcing would have different characteristics from a greenhouse gas-based warming; the characteristics of the global warming actually observed match the characteristics of greenhouse warming (also described above). Finally, since at least the 1980s, incoming solar energy has been generally flat or in slight decline, while temperatures have continued to rise. 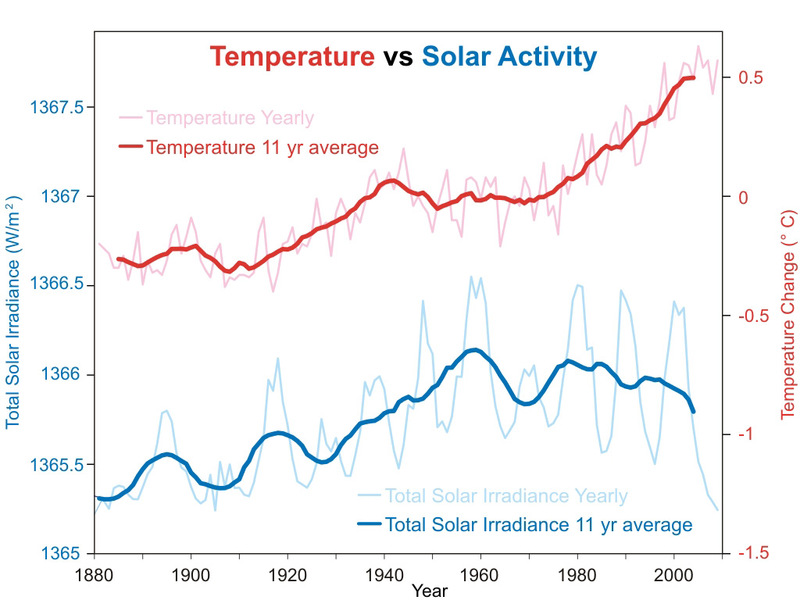 Temperature and solar activity trends decouple in the 1940s. Another very straightforward argument. Here, the claim is made that human sources of carbon dioxide are insignificant compared to other sources. Human agency in global warming, one infers, is off the table (and a follow-up inference that nothing needs to be done about the matter is very likely to appear). The two most common proposed alternative sources for the extra carbon dioxide are volcanoes and the ocean. The argument from volcanic CO2 is that volcanoes emit more carbon dioxide than aggregate human emissions. There are two methods of showing this is false. The first method is that aggregate human emissions are (at least) two orders of magnitude greater than aggregate volcanic emissions. The Skeptical Science rebuttal I have linked to indicates the Mount Pinatubo eruption in 1991 was calculated to have emitted approximately 42,000,000 (42 million) metric tonnes of CO2 into the atmosphere (along with stratospheric aerosols which imposed a slight cooling effect for 2-3 years afterwards), while aggregate human emissions in 1991 were 23,000,000,000 (23 billion) metric tonnes. The second method is noting that if volcanoes were in fact the primary source of carbon dioxide, the proportions of different carbon isotopes in the atmosphere would be stable with respect to proportions of C-13/C-12. Since in fact, carbon in the atmosphere is showing an increased proportion of the C-12 isotope (described above a signature of fossil fuel combustion), volcanoes are unlikely to be the primary source of all the extra CO2. The argument from oceanic CO2 is that the oceans are outgassing carbon dioxide, again with the expectation that this outgassing will swamp human emissions. We have three lines of counter-argument to rebut this claim. The first counter-argument is that in addition to the change in carbon isotope ratios, we find that the proportion of oxygen gas in the atmosphere is decreasing in proportion to the increase in carbon dioxide. This measurement is not consistent with ocean outgassing; it is consistent with combustion of carbon compounds. The second counter-argument is that claiming the oceans are the source of the extra carbon dioxide fails to account for measured human emissions, which I trust the reader will agree is a rather key omission. 30 billion metric tonnes (the approximate annual human emissions in the late 'noughts) of carbon dioxide do not simply vanish. The third counter-argument is that the oceans cannot be the source of the extra CO2 since they have in fact been taking up CO2, resulting in the above-mentioned acidification. Present & forecast trends are unprecedented in recent human history. The response to this is that the argument is a non sequitur. Whatever previous changes have occured in the Earth climate system, whatever their magnitude, it simply does not follow that human activity cannot have an effect or is not having an effect in the present. That CO2 is a greenhouse gas is confirmed by theoretical physics, laboratory experiment, and empirical measurement. By empirical measurement we know that humans have increased the atmospheric concentration of CO2 by approximately 40% since the start of the Industrial Revolution as described previously. Suggesting that this massive atmospheric increase in a proven greenhouse gas has minimal effects on the Earth climate system, as the argument from past climate change/natural variability seems to do, is ridiculous on its face. The third generic line of argumentation against the mainstream position on climatology is to argue against the consequences of AGW, even if the reality and human agency has been admitted to or agreed upon. 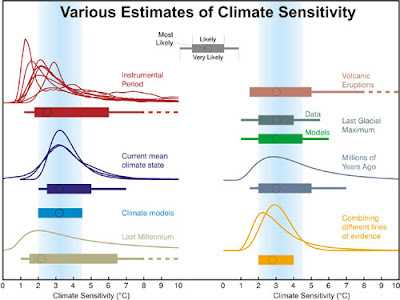 The five most significant arguments against the consequences, in my view, are the argument from low climate sensitivity, the argument from model unreliability, the argument from small numbers, the argument from increased benefits, and the argument from natural resiliency. Climate sensitivity is the expected reaction of the Earth climate system, usually expressed in the form of a change in global mean temperature, to a change in the sum of climate forcings (e.g. 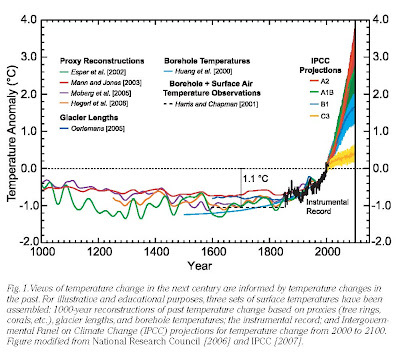 incoming solar radiation, temperature-independent concentration of atmospheric greenhouse gases, temperature-independent albedo) and the resulting feedbacks. Due to the interest in anthropogenic carbon dioxide emissions, climate sensitivity is most often expressed as the net change in global mean temperature resulting from a doubling of atmospheric CO2. The Wikipedia article linked to above notes that the mainstream position on climate sensitivity understands it to be in a range from 2°C to 4.5°C, with a best estimated value of 3°C. The lower bound of the estimated range is considered to be robust, while the upper bound is not as certain. Climate sensitivity is calculated using a composite of analysis of empirical data and output of climate models. From the start of anthropogenic carbon emissions to the present day, the Earth climate system has already warmed 0.8-0.9°C after an approximate 40% increase in atmospheric carbon dioxide. Since climate sensitivity is an estimate of climate response to a forcing equivalent to a doubling of atmospheric CO2, the fact that global mean temperature response is already brushing up against the high end of low-ball sensitivity estimates is not encouraging in this regard. 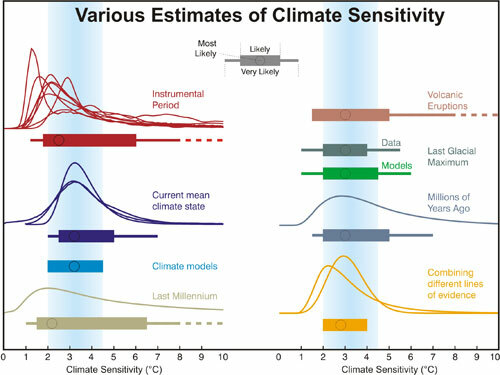 The best estimate range & best estimate value of climate sensitivity are, as noted, derived from combining multiple different lines of evidence and simulation. Lower estimates of climate sensitivity than this tend to rely on single sources of evidence (such as Lindzen & Choi 2009, rebutted in one of the links immediately above) or on shaky methodology. 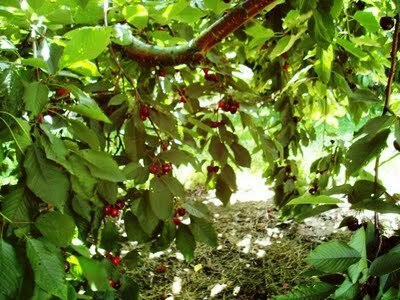 The former is cherry-picking; the latter is plain poor practice. A low climate sensitivity (particularly those suggested in the above-linked Skeptical Science articles) leaves climatologists without a feasible mechanism (from a physics perspective) to explain past climate changes. In particular, the glacial/interglacial cycles of the present Ice Age involve large swings in Earth's mean global temperature. A low climate sensitivity makes such empirically-measured changes very difficult to explain without some serious fudging. Given the inability of humans to create other Earths at a whim to perform large-scale climate experiments on, climatologists are required to resort to climate models, which are mathematical constructs (complex equations, in essence) simulating the Earth climate system. From simple origins, modern general circulation climate models (and no doubt other forms of modelling) are now fairly sophisticated, and capture with some degree of accuracy the complexities and vagaries of the Earth climate system. Of course, given the immense complexity involved, models can scarcely be said to be perfect in this regard. Models are, of course, constrained by the known physics involved. Models are commonly used to create projections of future climate change. Given the uncertainties and inherent unpredictability of the future (it is impossible to predict when, for example, a major volcanic eruption will occur, or what the behaviour of the El Niño Southern Oscillation will be from year-to-year), climatologists & organizations such as the IPCC typically posit a range of probable scenarios for future climate change. Model projections are inherently so unreliable as render their projections effectively useless. Model projections are characterized as alarmist or too aggressive in predicting large-scale change. 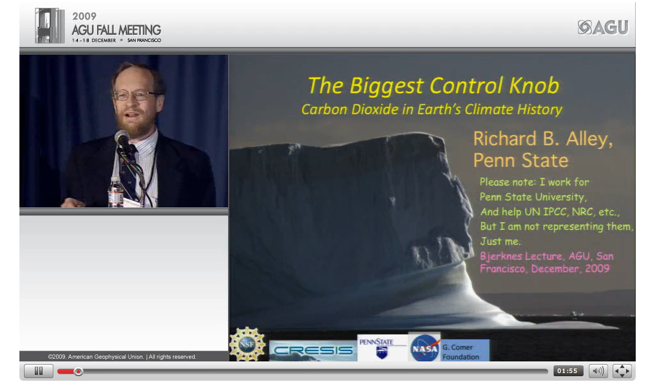 Model projections are claimed to be the sole source of climate science. This form of the argument from model unreliability amounts to declaring climatology to be a complete fabrication. As such, it is plainly an argument from conspiracy and has been, I contend, effectively addressed previously. As described previously, models are first hindcast against the temperature record. Models which can reliably match the temperature record to date when fed in the appropriate input are more likely to produce useful results when attempting to project climate change into the future. As also described previously, model runs undertaken, particularly on behalf of the IPCC, tend to the side of caution. 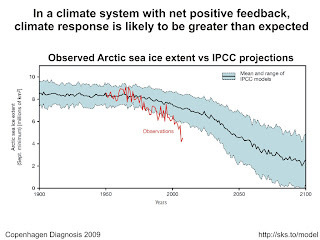 As a result they often underestimate future change (the Intermediate-level rebuttal shows sea-level rise & Arctic sea ice projections vs. IPCC model runs). It is worth re-emphasizing that to the extent that climate models are inaccurate, they are more likely to underestimate warming & other climate responses. The rebuttal to the argument from small numbers is this: when it comes to global mean temperature, small numbers make a big difference. A 5-6°C degree drop in global mean temperature is the difference between the location where I live being a bustling city and being covered by a mile-high ice sheet. On this view, even a seemingly small rise in global mean temperature can have significant effects (see here or some of the links above among the first-order consequences of AGW). ... and being covered in this. Of course, the article dates from 1995, and much has been learned in the intervening 16 years. Although I have previously linked to it, this article summarizes expected positive and negative impacts from AGW. The most significant negative impacts for humans are sea level rise, ocean acidification, and impacts to agriculture. See also my discussion above on the consequences of AGW. The article on extreme weather in the immediately-preceding contrarian objection is also a useful counter to the argument from increased benefit. In the light of the existing and projected consequences, there is little reason to take seriously any proposal that such increased benefits as exist will be sufficient to outweigh the penalties. This argument suggests that the natural world can easily respond to global warming: animal & plant species can adjust or adapt to the changed conditions. You can see typical examples of this argument here or here. As we have already noted, the present warming is occuring at a global scale at an unprecedented rate in recent geological history. There is little a priori reason to expect that animal & plant species, especially those already under stress from other impacts (introduction of foreign species, habitat loss, over-consumption by humans, and the like) will also be able to adapt to a sudden shift in climate, especially one (again, as described above) that in addition to its impressive rate of change will also lead to a global climate which almost none of the existing animal & plant species on Earth have previously encountered. The second variant of the argument from natural resilience which I have linked to has to do with coral bleaching. Both the article I have linked to regarding 2010-2011 weather and this article discuss coral bleaching already taking place (of particular significance is the note that in some coral reef areas, such as the Caribbean, there appears to be little evidence of mass bleaching on the scale observed today for as far back as 220,000 years). In short, the unique nature of the present global warming and the extraordinarily rapid rise in atmospheric CO2 lead, I contend, to the conclusion that it will be beyond the capability of many other species to adapt in time. While the suggestion that humans cannot or ought not to attempt to address CO2 emissions and attempt to halt (or even reverse) the current climate change is typically the final inference of one of the earlier arguments (after all, if it's not real, not us, or not bad, why should we do anything about it? ), sometimes this line of argument can be made on its own. One may concede all the other points regarding the reality, human agency, and consequences of AGW, and yet insist that concrete action be postponed or not undertaken at all. This line of argument has three general forms: the argument from ineffectiveness, the argument from cost, and the argument from development. The argument from ineffectiveness infers that we should do nothing to control atmospheric CO2 or emissions because it won't work. Usually this is coupled to an "It's Not Bad"-style argument to provide some extra reinforcement. This argument has two variants: a global variant, and a regional/national variant, the latter of which I shall treat here. The regional/national variant suggests that, because country X's emissions are such a minimal portion of overall emissions (or because controlling country X's emissions will make no difference), country X should not bother making an effort to control emissions. This variant of the argument from ineffectiveness is, in my estimation, very disingenuous. It is the free-rider calculation made in a prisoner's dilemma; the kind of calculation which leaves groups of people (whatever the scale of the group) locked in a collective action problem. If policymakers in enough countries accept this argument, then almost nothing will be done to control emissions. By contrast, if enough countries do take action, there will be a significant reduction of emissions (paritcularly if the countries are major emitters). The solution to a collective action problem is usually enforcing collective action as a solution. However, in the absence of an agency able to enforce the solution, actors stuck in a collective action problem must negotiate their way to a solution. The modern aggregate of nation states are in this position, with no agency capable of enforcing emissions limits, the way, say, cities can enforce anti-noise bylaws. 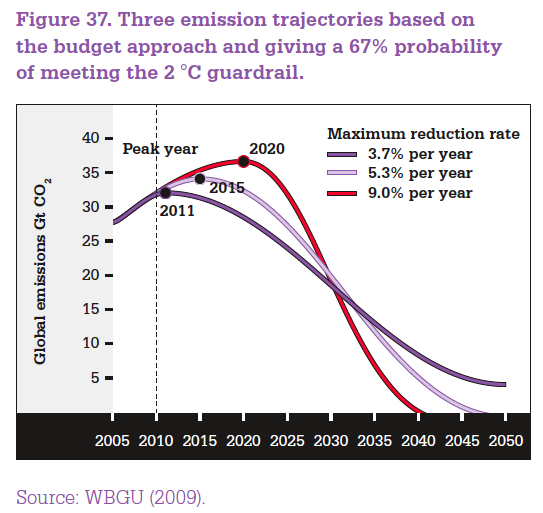 The global variant would be to argue that even a global effort to control emissions will have a negligible effect. 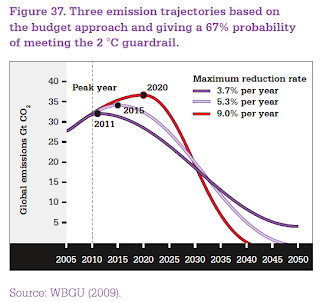 To counter that, I should like to present the findings of Australia's Climate Commission, which suggests that, if emissions controls with sufficient stringency are adopted by enough major emitters, global emissions of fossil CO2 can be reduced almost to nothing by 2050 (for those interested in the "Coles Notes" version, see here. This would stabilize atmospheric CO2, enabling carbon sequestration efforts to take effect without having to continually catch up to ongoing emissions. The World Wildlife Federation, partnered with environmental consultancy firm Ecofys, recently produced a report suggesting that it is possible to switch to almost 100% renewable energy by 2050 as well. Meeting or coming within close reach of these goals within the suggested timelines would certainly have an impact on present emissions. The sooner serious cuts begin, the less year-over-year cuts are required. Presented as is, the argument is a form of what University of Toronto philosopher Joseph Heath describes, in his book Filthy Lucre as the 'Count the Costs, Ignore the Benefits' Fallacy (28) The argument ignores the benefits that elimintating carbon emissions will have. The argument also ignores the expected costs from failing to check global warming. I have previously linked to this article in this post already; however, the specific links to papers on economic impacts will be of service with regards to this particular objection to taking action. As noted earlier a new summertime heat régime is expected to be on the way in the tropics (see also Mahlstein et al 2011). This article describes a paper documenting the regions most vulnerable to climate impacts (as well as an atlas of historical emissions). This paper (Mendehlson et al 2006) also documents the distribution of economic climate change impacts according to wealth. There is also this text from 2007, which also attempts to project the expected effecs of AGW at the regional/national level. Known physics supports the possibility that increasing the proportion of carbon dioxide gas in the atmosphere can cause an increase in global mean temperature. An empirically-measured increase in global mean temperature can be shown to be the result of human combustion of fossil fuels, returning long-sequestered carbon dioxide to the active Earth climate system. The consequences, whether knock-on effects from the warming or the alteration of chemical behaviour of other Earth system components (namely ocean acidification), are predominantly going to be negative from the perspective of ongoing human prosperity and development. Attempts to argue away the empirical evidence, the supporting physics, or the consequences, are often found, upon critical analysis, to be lacking in support. All this means that it is important for all of us to support efforts to reduce our carbon emissions, at the local, regional, national, and international scales. 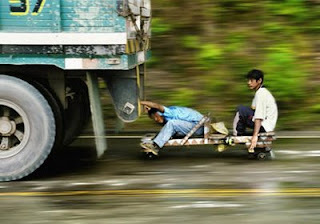 This is what websites such as Shaping Tomorrow's World are about. I do not doubt that making this effort will be strenuous and difficult; indeed, it may require the greatest aggregate of society-wide effort since the Second World War (save that the participants are not fighting one another, but rather cooperating to make large-scale internal changes). However, the results, as suggested in some links above and by these articles, are, I conclude, worth it. (1) As an aside, I should mention here that it is not uncommon for some to make hay on the difference between 'climate change' and 'global warming' as descriptive terms for the human agency involved in altering the climate forcing and its knock-on effects (see, for example, Peter Sinclair's take on this particular meme). The study referred to in this article indicates a noticeable difference in public reaction to the terms. NASA also has a summary of how one might distinguish between the terms. It is my opinion that the difference in terminology is negligible when one has reviewed the evidence. Humans are causing a global-scale climate change, which in this instance happens to be in the direction of warming. The key word in either term is anthropogenic. If, instead of causing a warming through increased greenhouse gas forcings, humans were causing a cooling forcing of similar effect on a similar time scale, the term 'anthropogenic climate change' would still apply. The sociological evidence shows, however, that my opinion is outweighed by the real effect of the use of the differing terminology. So much the worse for my opinions, so much the better for empirical evidence. (2) The website Skeptical Science includes a more-or-less comprehensive listing of common arguments against contemporary climate science or against taking action to halt and reverse the anthropogenic climate forcing. Their taxonomical structure breaks the majority of arguments down into three categories, which stand in opposition to the three major portions of this post. It is, in fact, this particular taxonomy of contrarian arguments which has led me to adopt the structure that I have. (4) The use of 'greenhouse effect' to describe the warming effect of certain gases in the atmosphere is, it must be admitted, something of a misnomer. Actual greenhouses rely on blocking convection from carrying heat out of the greenhouse system. The atmosphere, as we shall soon see, retains heat in the system by an altogether different means (convection being incapable of emitting energy into space). The misnomer, however, has been in longstanding use and so I shall not attempt to come up with an alternative here. (5) I should here quibble that if the entire Earth were to assume such a temperature for a substantial time period (in geological terms) that its actual albedo would end up being rather higher given the resulting freezing of the oceans, since ice reflects visible light much more effectively than liquid water. (6) I should point out here that Alley's discussion of the weaker solar output in deep geological time (he notes that incoming solar radiation at the time the Earth was formed has been calculated to be approximately 70% of current levels) also validates our understanding of the atmospheric greenhouse effect as described immediately above, for evidence of liquid water has been found to exist, per the linked-to presentation, back to 4.4 billion years in the past. It follows that something had to be keeping the Earth warm enough for liquid water at that time, and with much weaker solar energy the most promising candidate is a stronger greenhouse effect. (7) This is not an academic paper or a school project. I will cite Wikipedia. (8) My emphasis on empirical measurements is, of course, no accident. One common misrepresentation of climate science on the part of contrarians is that it is somehow based solely on the output of computer-generated climate models (of which more later). It seems to me that nothing could be further from the truth. Indeed, thus far I have referred to models but twice in this discussion, and then only to note that they have hitherto been too conservative in their projections compared to observations. Thus, the reflection of sunlight back into space on winter days is not appreciably altered where cloudy conditions exist compared to clear conditions. The reflection of infrared radiation back to the surface, however, is, leading to the milder winter temperatures during cloudy periods. Further, a globally warmer atmosphere can hold more water vapour (as noted above, water vapour content in the atmosphere is a function of atmospheric temperature), and therefore more cloud cover can form, year-round. Most importantly, this method is not how practicing climatologists measure the alteration of carbon isotope ratios. 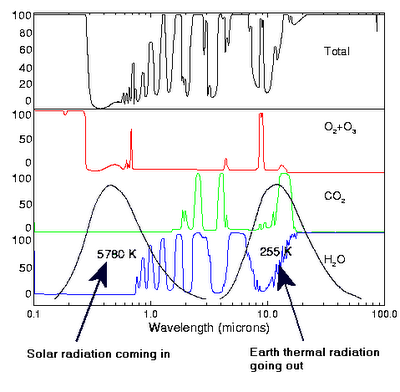 Carbon-14 is so scarce in the atmosphere that, as a proportion of the carbon component of atmospheric CO2 (already, for all its importance, a scarce gas as noted above), I suspect that its utility in this regard is very impractical, especially given its constant formation by cosmic ray action (as compared to its utility in radioactive dating in materials which have ceased to take up carbon-14). Without having seen a reference on the matter, I will conjecture that the constant genesis of new carbon-14 would quickly wash out any reduction in its proportion of total atmospheric carbon, in particular when taking the scarcity point into consideration. (11) Credit where credit is due: I obtained the 'evil twin' term from Skeptical Science, who appear to have obtained it from their sources for articles on ocean acidification. (12) I would quibble a bit and suggest it is not correct that the ability of a warmer atmosphere to hold moisture is what leads to both excess rain and drought, which the opinion piece seems to suggest. Rather, while the warmer atmosphere can hold more water vapour globally, warmer temperatures, regional variations, and altered distribution of precipitation cause the regional differential in flooding and drought conditions while allowing both to occur simulatenously in the context of a 'wetter' atmosphere overall. (13) The more blogs I read discussing the sciences, the more irritated I become with online versions of articles or opinion pieces of newspapers (or, for that matter, magazines) and their lack of links to evidentiary sources for claims. I assume this is a structural failure of online editions of newspapers generally, since of course (apart from a few self-referential links to news stories in the WP opinion piece) both columns on display here provide no links to sources. (14) Canadian expatriate Gwynne Dyer conjectures in his book Climate Wars that unmitigated climate change could lead to increased conflict, such as increased guerilla warfare by non-state actors (alias terrorism) from low-latitude regions, exacting violent revenge on the old-rich countries whose emissions are (as of 2011) still the largest share of CO2 in the atmosphere, or conflict between nation-states over climate-affected shortages in natural resources (Dyer postulates a possible conflict between India and Pakistan over a dwindling supply of water from the Indus River system as its glacier-fed components dry up). Another breakdown in international cooperation suggested by Dyer is the use of risky geoengineering projects by countries worst affected by climate change to delay the effects, despite these projects' own potential hazardous consequences. As previously noted, humans are already embarking on a massive geoengineering project by rapidly changing the chemical composition of the atmosphere & oceans, whose consequences are the main focus of this blog post. (15) A curious thing about the argument from thermodynamics is that there is a near-identical argument made on the same basis against evolutionary biology on the part of creationists, those who hold that the present diversity of life on Earth, and in particular the existance of human beings, is the result of independent acts of special creation. This view is most common among the religiously devout among the Abrahamic religions (Judaism, Christianity & Islam). (16) Most who object to or who are opposed to the mainstream (or consensus) position on climate science style themselves as skeptics. However, the contemporary semi-organized skeptical movement does not confine itself solely to doubting & examining climate science - indeed, most members of contemporary skepticism that I have encountered support the mainstream position. Members of the contemporary skeptical movement usually define skepticism as basing the acceptance of claims on the evidence that can be assembled to support them, and many self-described skeptics on the matter of climate science will accept and propagate very poorly-supported claims, completely unsupported claims, or even downright falsehoods (e.g. "Phil Jones said warming stopped in 1995"). As such, I shall here use the term contrarian to describe opponents of the mainstream position. Some who adopt contrarian positions on climate science, such as Christopher Monckton, go so far as to engage in systematic, mendacious misrepresentation of the evidence, of proposed policy to counter-act AGW, and so on. Such people earn the less polite, but no less accurate term, of denialist. (17) I had thought there would be an article on Skeptical Science in the library of contrarian arguments on the specific point of overlapping absorption spectra; I did not find it (it's probably buried in a comment thread). While this Yahoo! Answers question is not a contrarian argument per se (since the person asking the question is, I perceive, genuinely just looking for answers, rather than "just asking questions"), I am sure someone, somewhere on the Internet, has used the same observation in the form of claim against mainstream climate science. (18) The Heartland Institute which publishes the book in which Watts makes this argument is also evidently a sponsor or host of the speech made by former astronaut Harrison Schmitt as shown in the video I have linked to on the matter of cherry-picking. (19) To quote Dave Barry, "I am not making this up" (very first reader comment). (20) To be very clear here: I do not posit the existence of a global conspiracy to derail action on the matter of climate change on the basis of the temporal correlation of the hacking and the Copenhagen Summit. Rather, I expect that as few as one person interested in raising a ruckus would have undertaken the hacking and posted the information stolen on the Internet, allowing any like-minded individual to misinterpret and misrepresent whatever could be found at leisure. No coordinated action required. (21) The passages are reproduced in full in the Skeptical Science rebuttal I link to, and I am sure in countless other locations on the Internet. I will not reproduce them in full here. (22) Another startling similarity between anti-AGW argument and creationism is the insistence that the respective mainstream scientific position (in climatology and evolutionary biology, respectively) is somehow on the verge of dissolution within scientific circles, and that this or that single paper, article, or alleged conspiracy is the item which finishes off the mainstream position entirely. Suffice it to say that this line of argument is, in both cases, plainly false. (23) This objection to the mainstream position on AGW could also be an objection in the category of "It's Not Bad", since one implication is that while things may be warming now, there will be a natural 'downswing' coming up which will reverse the warming (the follow-up inference that this nullifies any requirement to take action will soon follow). Further, almost any deceleration in the rate of temperature increase, sea level rise, or ice melt can be interpreted to be the start of this 'downswing': global warming is said to have stopped on several occasions. (24) The title of the second criticism, "Just Put Down the Model, Roy", reminds me of this movie. (25) The second form of the argument from small numbers I describe comes from a textbook version of the argument I once read on Skeptical Science, in a comment thread, the location of which I unfortunately can no longer recall. (26) Near the end, the author cannot help but try to also argue a form of "It's Not Real" in addition to "It's Not Bad". (27) Indeed, it is possible, given the confluence of human impacts, that the Earth's sixth great mass extinction event is underway. (28) A short, fancy Latin (or English, I'm not picky) term for this fallacy must soon be invented. If it already does exist, please let me know! (29) Both the argument from development and the rebuttal rely to some extent on projections. The difference is that the rebuttal can point to past & present events (e.g. the disastrous floods in Pakistan, which as far as I am aware have no precedent in the history of that region since its inhabitants could record it) and that it is based on calculations using standard economic & AOGCM modelling (the latter of which are of course based on validated physics) whereas the argument itself tends to be an unsubstantiated assertion about the future. Any response on my part which would be of substance would have to be half as long as this post(! ), so that's not happening. I have had my doubts about climate change, although it has been years, I think, since I seriously questioned whether it was happening. In any event, your post has helped put those doubts to rest. I am impressed by the amount of effort you have put into this; moreover I do not think that this effort has been wasted (e.g., you didn't put all that effort into being, as you put it, 'contrarian'). I suspect that the unspoken premise behind opposition to the idea of man-caused climate change is 'but I don't want to change my ways'. If one of the largest contributing factors to climate change is emissions from automobiles burning fossil fuels, then, let's face it, we're going to have to start cutting back on auto manufacture and use at once. Of course, it will be said that this will cost jobs, but considering that, for example, the North American auto industry had to be bailed out by governments (so much for the invisible hand), it is hard to see how what is presently going on is working very well. You shall have to let me know how one puts in images and endnotes, for I do not yet know how - although in the case of endnotes, that's probably for the best. Many thanks for the work you put into this.